We live in times of unstoppable change. All around us. Everyday. Trump; North Korea; Trade war; Immigration; AI. The chess world is not an exception. 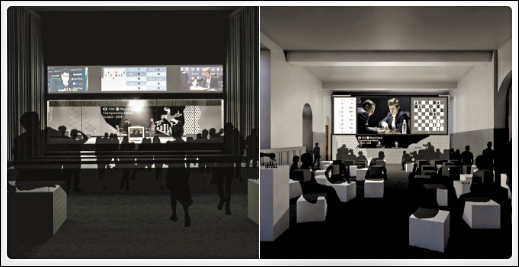 We can sense it at hand, both on the board and off of it: Biel indicates that Carlsen’s reign is approaching its endgame; Kirsan is out and Makropoulos’ days as interim-FIDE president are ending. 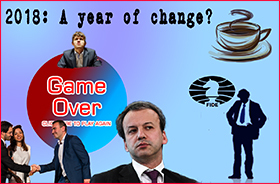 Dvorkovich is very likely in, come October 3rd, and FIDE will then become transformed into a modern, professionally managed and transparent international sports organization. Change demands it. 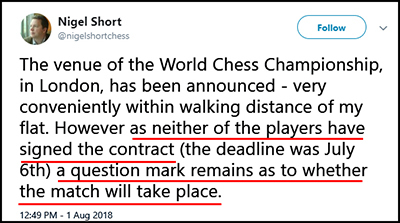 2018 London World Chess Championship in doubt? 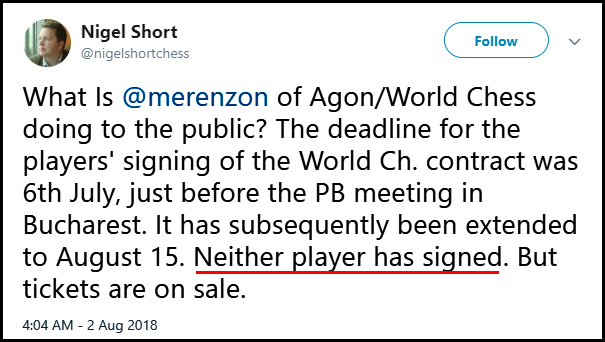 No sooner had it been announced yesterday that the 2018 World Championship between Carlsen and Caruana would be held in November in London that rumors started to spread in the English chess community that something was in the air that was could radically change Agon’s plans. Earlier Short had questioned whether the would take place. In particular, the name of the American billionaire Rex Sinquefield has been mentioned several times on the English Chess Forum .Are we likely to see another 1993-style rupture of FIDE with both Carlsen and Caruana agreeing to play their match outside the control of FIDE? I hope not, but Sinquefield is closely advised by Kasparov and that speaks volumes. Anything is possible. Now only Makropoulos does not have an official website.(Oops! He does! Link) Dvorkovich’s website is quite nicely done. Plenty of space for information and photos/videos. ‘‘I am running for FIDE President with a clear objective – to take FIDE up to the highest standards of professionalism, efficiency and transparency. Being deeply connected to chess since the early childhood, I had a chance to help promoting our game on many occasions, while my recent experience as the Chairman of the Local Organizing Committee for FIFA World Cup-2018 in Russia has helped me a lot to see a broader picture. There is also a ‘contact’ page where readers can directly interact with Dvorkovich, asking questions or giving advice. Mamedyarov – Carlsen ending: is it lost?